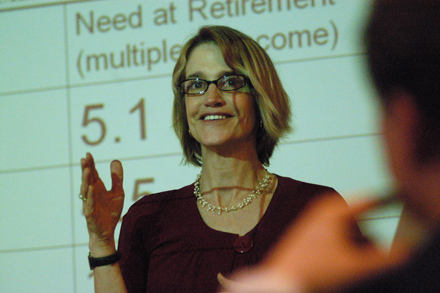 Teresa Ghilarducci, chair of the Economics department at The New School for Social Research and director of the Schwartz Center for Economic Policy Analysis (SCEPA), lectures on retirement security. Teresa Ghilarducci’s July 21 New York Times’ op-ed, “Our Ridiculous Retirement System” became the date’s “most-emailed” article, indicating that the Times’ readers recognize the importance of the argument she has been making for years: America’s retirement system is a shambles—and only the government can provide a solution. A large portion of the problem is caused by employers’ moving employees out of defined benefit pensions and into 401(k) accounts, which transfer the burden of saving to the individual. This has tended to increase retirees’ reliance on Social Security, the funding of which is also shaky. As recent SCEPA research has found, not only is the number of Americans covered by employer-sponsored pension plans plummeting, most retirees today have less than $30,000 in savings; they will live at or below the poverty line for the rest of their lives. Ghilarducci’s work proposes a surprising solution: already existing state-funded public pension systems, which she thinks should be opened up to private-sector workers. Issues of public funding for these systems notwithstanding, they are better and more sustainably managed than private accounts and, unlike 401(k)s, they provide a stable and reliable payment plan. The retirees themselves would not be the only beneficiaries: SCEPA research has proven that reliable pensions lend stability to the overall economy. Ghilarducci’s research explores the structural problems caused by increasing income inequality, highlighting a theme popular among New School economists: an unfair economy is an inefficient one. She points out that in the past two decades, much of the earnings growth went to the country’s top-earners, whose earnings above $106,800 are exempt from the Social Security payroll tax. One result is that the retirement system has lost potential revenue. Ghilarducci suggests gradually increasing this taxable earnings base so that by 2045, 100 percent of everyone’s earnings are subject to payroll tax. Perhaps most students see pension plans, 401(k)s, and retirement preparation as things that “will probably affect me … someday.” Ghilarducci, however, sees the issue as one that affects young people now. “If younger people are more secure in their financial future, they will be riskier in the early years of their careers, prompting search for the ‘dream job’ scenario, or courage to run with a small business idea.” A population assured of a prosperous retirement can spur greater economic growth during its working years, an outcome everyone can get behind. For more information on Ghilarducci’s research, visit SCEPA’s website.